Stephanie Roberts, front left, and Shannon Gray, right, lead participants in the 2nd annual SantaCon on Saturday, Dec. 17, 2011. SantaCon combined elements of flash mob and a pub crawl with Christmas carols and random acts of kindness. This year it included a food drive to benefit Just Food, the primary food bank for Douglas County. This isn’t exactly your kids’ holiday party. 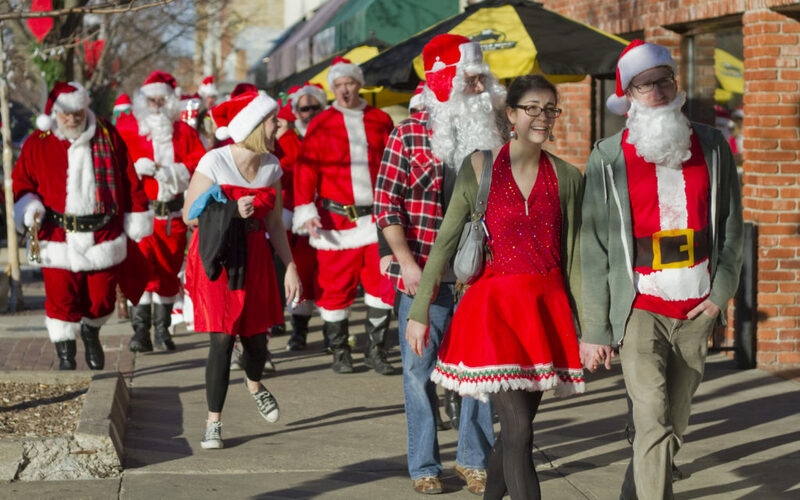 About 30 Santas (and maybe one or two reindeers and elves) met at the Sandbar, 17 E. Eighth St., on Saturday afternoon for the second annual SantaCon, a national trend in theme partying that’s spread to Lawrence. It’s basically a pub crawl for the North Pole set. It was a time to be jolly that also included a good cause: Among the rules for Santas participating (other than, of course, dressing with lots of Yuletide adornment) was to give a donation to Just Food, a Douglas County food bank. Ali Brox was in the minority dressed as an elf, but that didn’t stop her enjoyment of the ‘Con. She said she saw the event online and decided to come after having been to SantaCons in other cities. When asked what, other than popularity of the SantaCon trend, made the event appealing, she was almost philosophical. “What’s a better way to spend a December Saturday than to drink beer and dress up like Santa?” she said. Many of the Santas talked positively about the bemused expressions of passersby as they made their bar-hopping — their scheduled route included the Granada, Replay Lounge, Red Lyon Tavern, the Bottleneck and Henry’s — rounds downtown. Perhaps they couldn’t deliver too many presents, but at least they could spread some cheer. The Santas, for the most part, also kept up the SantaCon tradition of a little rebelliousness and a lot of anonymity, choosing to go by their Santa names for the afternoon. “Sleepy Santa,” who was outed as one of the organizers by two other Santas, said the event brought some timely, whimsical fun to Massachusetts Street.